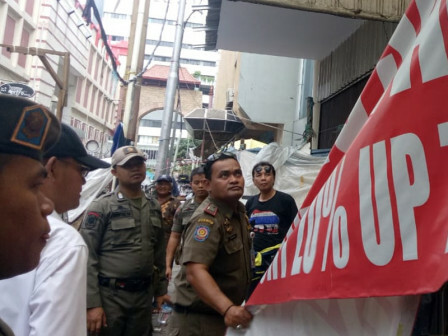 As many as 35 joint personnel were deployed to remove illegal billboards and banners in Sawah Besar Sub-district, Central Jakarta.
" We managed to remove four billboards and one banner in the field"
Sawah Besar Satpol PP Taskforce Head, Sugiharso stated that the raid was focused on Jalan Budi Utomo and Jalan Dr Sutomo, Jalan Pasar Baru, and Jalan Pasar Baru. "We managed to remove four billboards and one banner in the field," he expressed, Wednesday (11/28). In the meantime, Sawah Besar Sub-district Head, Martua Sitorus added that those billboards and banner have been brought to the Sawah Besar Sub-district office. "We will call the owner. If they really have to fulfill their obligations, we will return theirs. The calling deadline is up to 30 days," he stated.